For each player who suited up in a Blueshirt this season we will take the good, we will take the bad and take them both and see what we have. And this time around we started with the high numbers and are up to #45, Kris Newbury. 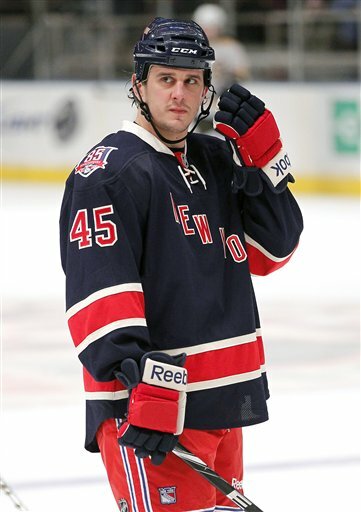 #45's #s: 11 games, no goals, one assist, -1, 35 PIM. Take the good: Newbury was an energy player who knew his role and did his damnedest to earn a spot on the team. He got into three fights over his short time with the big club and Hockeyfights has him winning two of them. And Newbury won 60.7 percent of the faceoffs he took, second only to Sean Avery (of all people) on the Rangers. Take the bad: I was livid over two of his fights as Newbury's exuberance caused him to jump the other player instead of honourable squaring off. Despite forechecking well, he managed just six shots over his 11 games and came away with one assist. He had no recorded hits in three of his games - completely unacceptable for a grinder. Take them both and then we have: A perfectly adequate minor league callup. Newbury wins faceoffs, isn't a big a defensive liability and adds energy. He isn't going to score goals, he isn't going to wow crowds, he isn't very big ... he will stand up for his teammates and do his job. Can't ask for anything more.